The magnetic particle inspection method can detect surface and near surface defects in ferromagnetic materials such as steel and iron. The inspection method can be applied to raw materials, and parts or products during various stages in the manufacturing process. It can also be employed during equipment or machinery maintenance and overhaul to find fatigue cracks. The inspection is performed by spreading fine magnetic particles over the surface of a specimen as it is being magnetized, causing a buildup of particles at discontinuities such as cracks, laps, inclusions or seams. The particles have high magnetic permeability, and are easily magnetized and attracted to small magnetic leakage fields created by the discontinuities. A trained and experienced technician interprets the indications observed during the inspection. Particles can be applied as a dry powder or wet in a suspension of petroleum-based or water-based carriers. Dry particles are most commonly used for inspections in the field. Fluorescent wet inspection is considered best for detecting very small discontinuities. It employs smaller particles in a liquid carrier allowing particles to flow easily to small leakage fields to form indications. 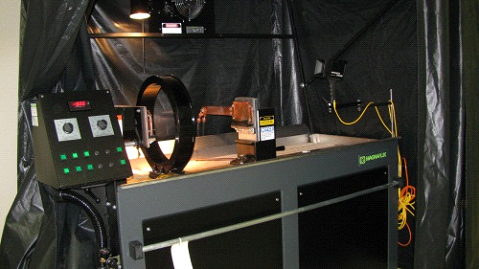 The most common method used for magnetic particle inspection is the fluorescent wet continuous method using full wave direct current (FWDC). The part is placed into our wet fluorescent horizontal unit and then the magnetic field is applied while the suspension of magnetic particles is sprayed or poured over the test sample. Our horizontal unit is 6 ft. long, and can accommodate parts up to 54” in length and 300 pounds. Larger size parts are inspected using yokes.